One of the most famous teachers in the Western world in the twentieth century was Archbishop Fulton Sheen. This man had a tremendous success in the early years of American Television. So much so that he was elected Television personality of the year in the United States. He preached all over the World promoting love of Christ, faithfulness to the church and the gospel. He wrote over 100 books. When asked what inspired his life, what was his great devotion he replied that from many years He made a Holy hour before the Holy Eucharist everyday of his life. When he was asked how he began this devotion he told this story which happened in China. In the 1940s the communist red army under Mao Tse Tung overran mainland China. 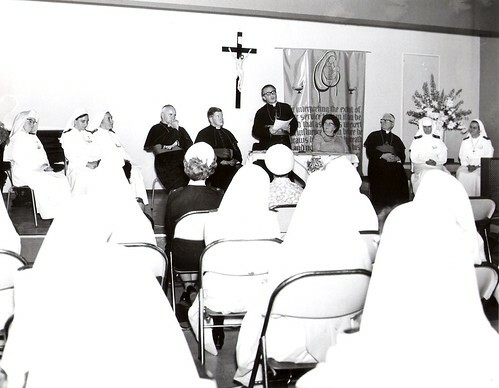 On their way across the country they destroyed missions, parishes and catholic institutions. 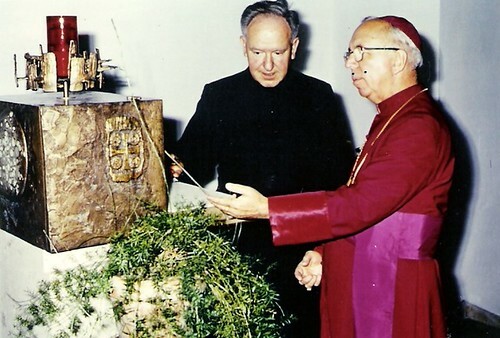 In one parish they smashed the doors and windows of a parish church, they blocked the doors, they smashed the tabernacle and drew the ciborium out of the tabernacle scattering the consecrated hosts on the ground. The priest was imprisoned in his house next door to the church. From the window of his house the priest could see into the church and he counted 31 small hosts lying scattered below the altar. Each afternoon the priest noticed a small Chinese Catholic girl aged 11 come secretly into the church. She knelt in great devotion before the Eucharist lying on the ground for one hour. At the end of the hour with great humility she bent down and with her tongue received a host. 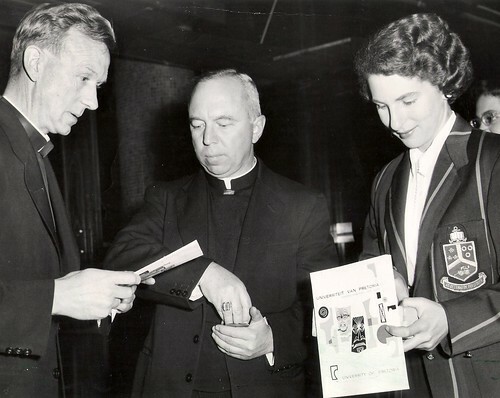 At that time catholic laity did not touch the second host with their hands. So for 31 days, each day the girl came quietly in past the soldiers and unnoticed knelt, prayed and then received the host. On the last night the soldiers who were guarding the building came back suddenly and found her. They dragged her out of the church and beat her to death. Archbishop Sheen said that the great faith of the little Chinese martyr girl so inspired him that he determined himself to make a holy hour every day. And he said this practice had been the blessing of his life. The meaning of priestly life is largely centered on our faith in the word of God and in the Holy Eucharist. 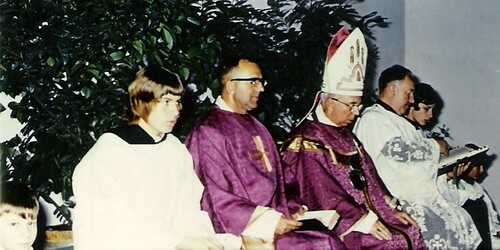 The priest by definition is the person who continues the priesthood of Christ in the church. By listening to the Word and spending time with Jesus present in the holy Eucharist, the priest absorbs Jesus into his soul and prolongs the presence of Jesus in the World. In the document Pastores Dabo Vobis 12 we read; “the priest prolongs the presence of Christ, the priest embodies His way of life today and makes him visible. Again; “Priests are the sacramental representation of Jesus Christ”. So it is that when a priest baptizes it is not he but Christ who baptizes. When the priest absolves it is actually Christ who absolves, when the priest anoints it is actually Christ who anoints and when the priest preaches the word of God it is Jesus making his word heard once more in the world. Our priesthood is as strong as our faith and confidence in Christ. In the scripture reading we have just heard St Paul to the Romans chapter 8. We find Paul basing his hope, his confidence, his Ministry on his union with Christ. He tells us that nothing can separate us from Christ. Elsewhere Paul says; “To me to live is Christ”. St John says something similar, “I am the vine, you are the branches”. Eucharistic adoration is a heartfelt invitation to us to come to know Jesus and to allow him to come to union with us. If the people are to see Christ in us then we must spend time in the light of Jesus. If we spent time in adoration of the Holy Eucharist then we become warm with the humanity of Jesus. Even a cold stone standing on the sunlight becomes warm. So our cold hearts become warm as we stand in the light and warmth of Christ. We must take time each day to visit and adore the Holy Eucharist. St John Vianney speaks frequently of the absolute importance of the Holy Eucharist in the life of the priest and this man reflected Christ to all who saw him. 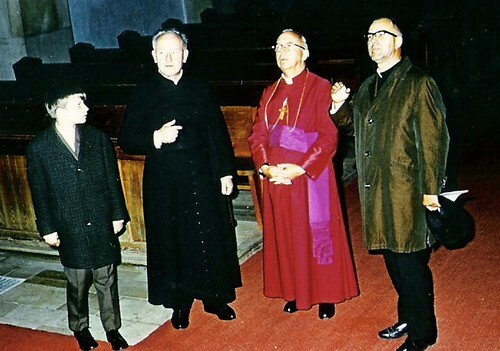 Once there was a man who wanted to visit St John Vianney about whom he had so many things. This man walked for three weeks to come to the village of Ars where John Vianney lived. The man spent a week there and then …. He being away for seven weeks. When you arrived home his neighbors asked him about his visit …to us and about the parish priest, John Vianney. The pilgrim said yes he had seen John Vianney in the Church in us. The people asked what did John Vianney say? The man replied that John Vianney had rather week voice, the church was always full of people and he actually not heard anything John Vianney had actually preached. When the people laughed at him and asked him well what did you see in eyes? They man replied I saw God in a man. 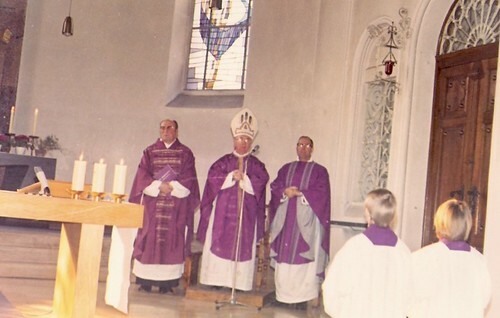 This man was able to ….him the absolute respect for the Eucharist of John Vianney showed in the church. He also so his gentleness in confession, he felt a tremendous devotion in this man and dedication to God. He felt that this man totally believed in what he was doing. And noticed that John Vianney had wonderful hospitality and respect for people. And all this was the result of Christ’s presence in the saint. And this presence came above all from John Vianneys’ union with Jesus in the Holy Eucharist. We, priest are meant to make Christ present by world and by life. One time a village girl was preparing for her marriage. Since she was a dress maker she decided to make with her own hands a wedding dress. But she wanted a particular textile in order to make her dress. She tried everywhere for the proper material but nothing satisfied her. Eventually she went to a large city and try store after store. In one large store having spent two hours searching for what she wanted one of the attendance asked her, tell us precisely what exactly you are looking for? She said I need a textile that rustles, that makes a gentle noise as I move in it. The attendant asked her, why do you want a dress which makes noise and rustles? Well, my Groom, my husband to b is applied. And I want him to perceive, to notice to hear that we are together on this great day of our lives. That we are together. As we go through ceremonies and celebrations of the day together he will hear that I am …he will know that he is not alone in spite of being……. He will know that there are two of us together. In a certain way a priest is meant to rustle with the presence of Jesus. The presence of a priest in the church and peoples lives in like a sign, is like a reminder, is like a memory, is like a call that Jesus is reaching out to those around us in the world today. We of course human beings must struggle to be present to Christ. We are inhabited by ……..of sin, by our lack of time for prayer, by the fact of fear for more boundaries in our lives to make a space and time to be with God alone. In fact we live our lives often as if God not exist. Another priest was dying one time and he was very afraid of death. Many people tried to console him. Even the bishop came to see him. And the bishop said to him, “well you had confidence, remember all the great sermons you preached. The old priests looked like…..the bishop and said, “if God does not mention the sermons neither will I”. Yes, there is a lot of selfishness even in the good we do. There is also a self cantinas in all our thinking and in all our work. So we battle in order to be present to Christ and consequently to make him present. If Jesus is present to us we find ourselves being more radical about out priestly call. Remember this characterizes the spirit of Jesus. He was radical. He said, “Be perfect as Heavenly Father is perfect. He said, “Leave all and follow me”. He says if your hand give scandal cut it off. He says those who put the flower look back are outfit for the Kingdom of God. We have made a radical decision to live a very definite clear unique way of life. Pope Benedict points out great necessity for holiness in the priest. He says it is true that the sacramental liturgy comes to people irrespective of the holiness of their minister but when the objective holiness of the sacrament is … we can expect great results. Yes, we must have confidence. ….called to a school which I was told was … by evil spirits, it was a school of nine hundred secondary school young man and women in a rural area. When I arrived at school the principal told me that 37 of these young people had for three months totally upset the life of the school. ….they say they were possessed , they say there was legion, they speaks at the cross, ….and showed signs of being taken over by Satan. I waited in the office as the principal prepared the school for prayers. There he came back bringing the 37 young people who stood one side of the room ….across … The principal said what are you going to do now? I intend to laugh. Yes, I laugh because the spirit that was in me not because I am a bishop or priest, or because I was baptized in the spirit of Jesus who loves us is not strong like any spirit that these children have as he take them out and prepare them for prayer and just a joke. Everything was quiet and silent. And so by our prayer we can bring great change in the parish and in the lives of people around us. There was a sheik one time who was wise and old. In his will he left his seventeen ….to his three sons. He ordered that one have of the ….be given to the first son, one third to the second son, and one ninth of the… the given to the third son. When he died a great difficulty arose. How do you divide the …in this way? Half of 17 … is eight and a half … who wants half…? And so there is …for a long time. There a neighbor who was as wise as the old man offered the sons one of his own… Then now they are 18 …. So the elder son get nine, the second get 6 and the third son get 2. Now …when we add this nine and six and two we get seventeen. And the 18th … remains and can be returned to its owner. This …came on the scene, it solves the problem and it disappear again. Prayer is something like that, holiness is something like that , union with Jesus in the life of the priest is something like that when it is present it resolves problems almost in a transparent way.